I'Ll Be honest: We had no idea what to see and do in the Philippines for 21 days. For years I have admired photos of their paradises, I was at the top of my bucketlist and I knew that at some point I would get to travel to their postcard beaches. However, he was unaware of his infrastructure problems and his tedious distances. And What to say about the itinerary: With so many islands, it becomes extremely difficult to choose what to visit. Second stage: Swimming with the sardines of the "paalboal" and the waterfalls of Kawasan. Third stage: Siquijor and Witchcraft in the form of a mosquito. Fifth stage: PALAWAN and Hope (never lost). Although I usually travel for free, this trip to the Philippines has been the least prepared in history. At least, mine. We Bought tickets for the Madrid-Paris-Shanghai-Manila route with just a couple of weeks in advance and moments before the first flight we decided to book one more flight from Manila to Cebu, guided by the weather forecast. And traveling in August to the Philippines requires cautiously choosing which places to visit. Our route has not been the best, but that is why I will share with you my experience, advice and what things we would have changed, so that when you design your itinerary you can compare and make the pertinent decisions. The photos that appear in this post belong to our Instagram accounts and were published during the trip. Click here to get online resources to help you prepare your trip to the Philippines. Click here to read the post and see more pictures of Bantayan. Our flight arrived in Manila with some delay but in advance enough to change our cash in the terminal and buy a SIM card for our stay before embarking on the next flight. Once with the Philippine currency in our pocket and our new phone number we switched from terminal to fly to Cebu City. While We waited to Bill we decided which island we would visit first. The easiest option would be to stay in Cebu City to rest from the long journey, but we prefer to continue traveling for sunrise and the next day on some Dream island. We Consider two options. First of all we thought of Bohol as it does not take too long to arrive by boat from Cebu City (although for that it would have been preferable to have flown directly to Tagbilaran). From Bohol We were attracted to the Chocolate Hills and scuba diving in Balicasag, but we had read that Alona Beach, the most typical place to stay on the island, didn't used to like it too much. Finally we decided to we would visit first the beautiful island of Bantayan, which promised to be the perfect place to sunbathe and rest: Just what we needed to recover from jet lag trasás more than a day traveling. Once we arrived at Cebu Airport, we took a taxi to the North Bus station and for the first time had contact with the congested traffic of the Philippines. To get to Bantayan, we took a bus to Hagnaya and after about 4 hours on the road, we were able to take the ferry to Bantayan. We Went straight to a hotel in Sugar Beach recommended by the Lonely Planet, haggle a little (very little, since we were very tired) and finally stepped on the sand of the beach and coinciding with the sunset. TIP: In The Philippines This was the general trend: as much as Madrugásemos, we lost almost all day in changing the island. It Is something that is quite heavy and I really recommend not covering too many places or you will spend too many days on the road. What we would have changed from this stage: Bantayan just loved it. We Could have added the visit to Virgin Island if we knew at this point that we would not have much more opportunities to practice the island hopping. Click here to read more about our experience in the US. Click here to read more about our visit to the waterfalls of Kawasan. In Bantayan We were delighted, but the options offered By the island were somewhat reduced. Having already visited its beaches we decided that the Philippines had much more to offer and that it was time to change the island. We Thought First of visiting Malapascua: from Bantayan not take much to arrive and could snorkel with the fox Shark! But We also wanted to visit Apo Island to be able to swim with turtles, south of Cebu, so we had to choose. Finally we opted for this second option, so this day we rose early and we started. We Take a tricycle to the port, a boat to Hagnaya, one go to Cebu, a taxi to the station of V-hire in Cebu City (Seaside Mall), another go to alboal, and finally a tricycle to Panagsama Beach. Moments after getting room at Panagsama, it had already been done at night. We Woke up with a horrible day: grey clouds, torrential rain and depression. 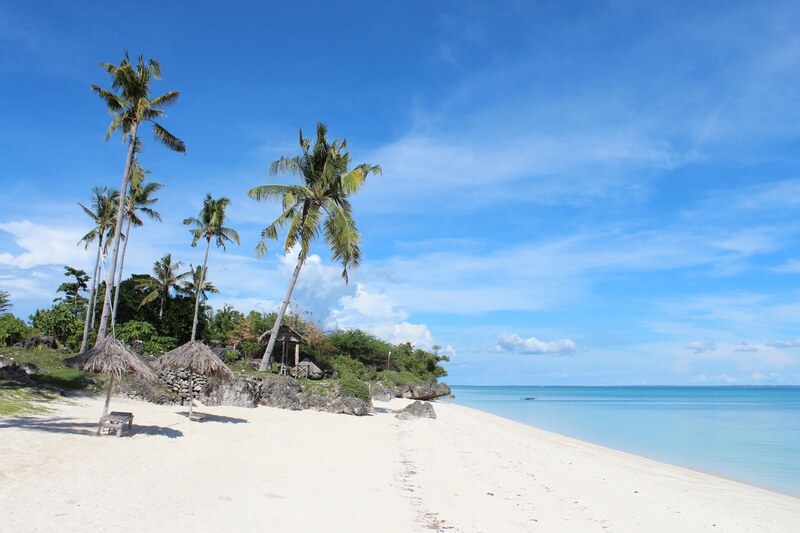 I was pulling my hair: Why had we left Bantayan? Why wouldn't we have gone to Malapascua, if it was easier? While we considered the option to spend this day traveling again to the Visayas islands of the south, we sat in the rocking chairs on the terrace of our room, just above the sea and finally swam with the incredible bank of sardines. The bathroom made us Reconciliásemos, so instead of leaving that day we decided to we would visit the waterfalls of Kawasan that same afternoon and the next day we would change island. To do this we only had to take a tricycle and a bus. The Waterfalls of Kawasan are impressive. It Is a cascade of several levels, being the first that you find the most caudalosa and the last the quietest. In This one we stay most of the time. https://www.instagram.com/p/BIcYjSfhQ-P/?taken-by=dianamiaus For When we came back to our hotel room we realized that what had started as a bad day had ended Up being practically perfect. The next day we would go back to the road, heading south. What we would have changed from this stage: transport to and from the city was very tiring but it remains a good stopover between the north of the island of Cebu and the islands closest to the south coast. We would have preferred to change the route and go directly from Bantayan to Malapascua and from there visit the beautiful island of Kalanggaman. I recommended it to a girl who was right after us and loved this itinerary! Click here to read more about our days at Siquijor. Day 6: From alboal to SIQUIJOR. We Hesitate to go to Apo or Siquijor first. We opted for the second so We could rest more days on the same island, as being constantly traveling in the Philippines tires and a lot. In Addition, we had already booked the flight from Cebu City to Puerto Princesa, on the island of Palawan, so our days in the Visayas had the hours counted. To get to Siquijor from the school we had to take a tricycle, a bus, another tricycle, a boat, another tricycle, a ferry and finally, a jeepney that left us in the area of San Juan. Although we had up early, when we arrived at Siquijor it was already dark and a strong wind blew. However, it cost us nothing to find neither accommodation nor where to dine, even in the dark. The first day we took it easy and did not rent motorbike. We Took a tricycle to Coco beach Gove and kindly the driver told us how to get into the beach without paying the entrance fee. Once on the beach, we appropriated one of his wonderful sun loungers to rest and leave our things while we missed to the water with our snorkel goggles. During our days in Siquijor the wind was not stopped and the sea was quite scrambled, so the snorkel was also quite limited. Still, in the stagnant water of the shore of this beach you can find starfish, needles, and a lot of small fish. I woke up devoured by mosquitoes. Already in one of the bites had given me an allergic reaction and had to visit the pharmacy, so I kept pouring the cream I had bought my new collection of bites. We Rented a motorbike to explore the island. First of all we head north of the beach of Palin. When We arrived we found it made a real disaster, and this was the general trend of the beaches of Siquijor during these days: Due to the strong wind and swell the beaches were full of algae, sticks, coconuts and also rubbish. We had one ace in the sleeve: This day we dedicaríamos to visit the waterfalls of Siquijor. We headed first to the waterfall of Lugnason, but the sign that indicated the detour from the main road showed a notation that said "No Water" with a sad face drawn to the side. We Asked in a shop and they said that at this time of the year the waterfall had no water, but we could visit the waterfall Cambugahay, the most beautiful of the island to consist of 3 levels. So we headed to the waterfalls of Cambugahay. On the way we wanted to visit the Bearing Tree, but we did not find it neither to the IDA nor to the return. https://www.instagram.com/p/BIt96_uBoX_/?taken-by=dianamiaus on returning, we stop at the beach of Salamangka, which was in the same state as the beach of Palin: Dirty and Ungentle. We Were about to leave this day. If we did not do it already, we would not give time to visit Apo Island and besides, mosquitoes would riddle me every night. However, this day dawned sunny and with less swell than other days, and we had left beaches to visit on the east side of the island. So we went back to take the bike and threw ourselves on the road. We Went straight to Salagdoong beach for being farther away. The access to this beach is impressive as it runs through a road framed by the beautiful Salagdoong Forest. At the time of paying the entrance we were told that that day it was forbidden to jump from the trampolines due to the strong swell. Siquijor not stop to give us these little dislikes, but still we were able to enjoy equally the turquoise waters of this beach. On the way back we did not visit Kagusuan Beach because we spent the detour. Nor Did we find, once again, the signage for the Old Balee Tree so we headed straight to San Juan Population to buy a solution for my annoying bites. What we would have changed from this stage: Siquijor was never in our initial plans and although it is a great island, cheap and easy to travel by motorcycle between beaches and waterfalls, we could not enjoy it at full. The Sea was too scrambled and we could not enjoy the snorkel as we would have liked. We were very Sorry not to have visited Apo Island as swimming with turtles was one of the things that attracted you most from going back to Southeast Asia. I Returned to dawn with another twenty more bites, but with the certainty that this time the island could not catch me again. After Breakfast we headed to the port in Tricycle and took a ferry to Dumaguete, another tricycle there and finally a boat to Cebu. There we took a bus to Oslob. It seemed like an intermediate point to rest before taking our flight to Palawan from Cebu City. Although in Oslob you can swim with the whale shark, it is an irresponsible activity so it did not come into our plans. We Did want to visit some nearby waterfalls and the private island of Asmilon, so we chose a hotel with swimming pool to rest before flying to Palawan. When we arrived at the hotel, we were told that the waterfall did not have much water at that time of the year and we were discouraged, and finally we also ruled out the visit to Asmilon as we saw it too touristy. Basically we are dedicated to rest in the pool before our week of island hopping in Palawan (Error!). TIP: If you want to swim with the whale shark in the Philippines, look for another more responsible option. A good place in which it is possible to do it is in Donsol and the best time for it is from February to May. Although our hotel was right on the beach, this was of stones and just like in Siquijor, there was quite a swell. This Day we only went to the market and ate with the locals on the road. Most of the time we spent it next to the hotel pool. What we would have changed from this stage: in Oslob we did absolutely nothing but rest in the hotel pool and plan the next stage of the trip, Tomándonoslo as a break as we thought we would not stop in the whole week that we were ahead. Finally It was not so it would have been a good idea to go up to Osmena Peak in Dalaguete, the highest point in the Philippines. It Is easy to climb and it does not take just to reach the top! If we had jumped Siquijor, we could have quickly visited Panagsama Beach, Kawasan and Osmena Peak and from there to have flown to the Nest before the typhoon came. Click here to read more about our days in Palawan. Day 12: From Cebu to Palawan. We woke up very early as this would be the hardest day of the trip in terms of transfers. We Took the bus to Cebu City, which was becoming more and more crowded. The bus rides along the coast of Cebu Tire, but they really are beautiful. Filipinos make life by the side of the road and you can learn a lot from their lifestyle just stopping to watch a little bit. When we arrived at the Cebu City bus station, we would stop for a drink at a nearby shopping mall where we also took advantage of getting money from a cashier. When we wanted to take a taxi to the airport, most taxi drivers did not want to lead us to be rush hour, but we finally found one that did accede. When we landed in Port Princess we had a hard time getting a van. Everyone tells you they have the full van, which comes out right now… The reality is that they always wait to fill it completely, and although it is necessary to understand that it is their work and way of life, it can become very tense. We Arrived at our little beach Cottage at Corong Corong at midnight. We booked it with Airbnb as we had discounts available and our host left the door open so that we could enter directly as soon as arrived. It Dawned sparkling and we saw some boats coming out on the tours even though the sky did not bode well. We took it easy: we had almost a full week ahead and we could wait for a more sunny day to get out on the tours (mistake!). https://www.instagram.com/p/BJvpL-TBM6X/?taken-by=dianamiaus we Decided to walk to the beach of the Cabins. When we arrived at the beach, the tail of the typhoon deployed all its intensity and we took refuge in one of the establishments on the beach. We Went Back to our room at the only time of the day when we subsided a little rain. From Our terrace we watched as the tourists who had left the tour came back: literally draughts to the bones. No tours went out This day. Every morning the Coast Guard decides depending on the weather and the state of the sea if the boats can leave or not, and this was one of those days when you could not leave. But it was barely raining. We Decided to walk to the Nest. We Ate there and as the beach didn't really like it, we decided to take a tricycle back to the beach at Corong Corong. For a couple of hours the sun came back to hope, so we took the opportunity to walk along this beach arriving almost to the Cabins, until the rain and the wind returned, returning to reality. We woke up with torrential rain. This Day was planned a tour and we had wondered if we wanted to unite, but seeing the falling we decided not to. The tours usually leave at 9 am, and at 11 the group still did not leave. We took it for granted that they wouldn't come out today, so we got into the room. After a few minutes, we left the room and found a double surprise: the tour had come out and the sun was shining! We went back to the beach of The Cabins as the first day we had not been able to enjoy it. Once there, first we were very encouraged thinking that time would improve. However, hours later the heavy rains came back and we realized that perhaps we had wasted our only chance. TIP: If This happens, you can try to contact some fisherman on the beach to take you on your own boat. Again dawn with intense rain. We were Not surprised when mid-morning we were informed that today the tours would not come out, so we decided to visit the twin beaches of Nacpan. We Considered the option of going by motorbike but decided to go in tricycle to avoid that we fell a shower on the way. Although It comes out quite more expensive, it was finally a good decision. TIP: If You go on a motorbike to Nacpan and the days are rainy, rent an appropriate motorbike (Moto cross type). On A scooter you can not move forward: along the way we met a boy who had been spoiled and another who had to go to the main road, dragging his scooter through the mud. The Dirt road is quite long. Another Day without leaving the tours and we decided to return to the beach of the Cabins for lack of options. Our last day Conservábamos hope. We Waited until we communicate the Coast Guard decision for hours, until we were finally told no, that no ship could leave today either. Already resigned, We decided to walk along the beach of Corong Corong and quickly the tail of the typhoon began to deploy its force once again. We got into a resort for a drink and ended up in the cabin of some locals, singing and playing the guitar. What we would have changed from this stage: I recognize it, we were emperrados to visit the peninsula of Bacuit from the Nest and that did not let us advance, waiting without success to improve the time. It Would Have been better to have visited Port Barton once seen the beaches of The Cabins and Nacpan, as we didn't do much more than worth worth it. Personally, if I returned to the Philippines in August I would not go to Palawan and I would visit Siargao, where the weather is generally better at this time of year. It Is An option that we had also considered, but with only 21 days you have to risk and choose. A van was waiting for us at the door of our pension. This One left us at the airport where our flight had a delay of about three hours for meteorological reasons: in Manila they were on orange alert for the typhoon and the planes could not land. When We finally arrived at the Manila airport we took an Uber to our hotel. Due to the orange alert the traffic was brutal! After leaving our stuff and giving us a quick shower we went for dinner. We Were in the middle of the red light district, so the atmosphere was a little strange: clubs, barefoot kids asking, only men everywhere… However, I did not feel insecure. TIP: Do Like us and fly to Manila at least one day in advance if you have to take your flight back to Europe. Delays are very common. We Abandoned with a terrible grief our comfortable hotel bed, knowing it would be a long time until we could sleep again horizontally. The next night sleep only on the plane and we were expecting an intense day in Shanghai, so we took it easy. We Left the backpacks in the hotel slogan until the evening and headed to a nearby mall for breakfast and morning. We Finally kicked out most of the day at the Century City Mall, enjoying the Starbucks cafes and WiFi. We Tried to go up to the Gramercy Residences, the highest building in the Philippines, but unfortunately the last floor was under construction. After dinner and picking up our backpacks at the hotel we headed again at Uber to the airport. TIP: Use Uber instead of the taxi in the Philippines, especially in Manila: once you try it you will be convinced! And Remember that you have your first trip with Uber free with the Uberdianamiaus invitation code. Click here to find out what to do in Shanghai in 1 day.